FSU Art MFA ’17 Michelle Eccles opened her shared exhibition, “It Really Is Dreamy, Isn’t It?” with Ehren Fritz Gerhard at 621 Gallery on November’s First Friday. The exhibition will run until the 24th of November. Artist Statement from Ehren Fritz Gerhard: “My imagery depicts an intense encounter with time and place. It’s the feeling I get while crunching through leaves and branches listening to the air whistle through my nostrils. I can step on a snake, stumble upon a wild boar or end up with a spider web all over my face. 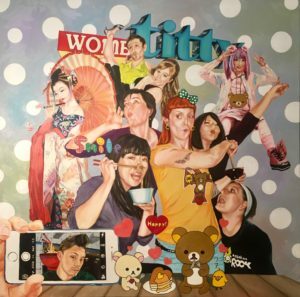 Artist Statement from Michelle Eccles: “I paint figures that inhabit enigmatic spaces that are the product of intermingling cultures and hyperreality. My characters include friends and loved ones, but more notably, the intriguing and complicated personalities I met during the nine years I lived in Japan. I project my feelings of envy and admiration on these characters and live vicariously through them. Bios: Ehren Fritz Gerhard completed his Master of Fine Arts from Arizona State University in 2013. He is currently employed as Adjunct Professor of Art at Florida Gulf Coast University, Art Exhibitions Director for the Centers for the Arts Bonita Springs and Director of the Bonita Springs National Art Festivals. He lives in Cape Coral, FL with his wife, dog, and cat where he maintains an active studio when he is not working in his garden or going on primitive camping and fishing trips. receiving her Masters of Fine Arts at Florida State University. She teaches painting and drawing courses for the FSU Department of Art and is the recipient of the Florence Teaching Fellowship. She currently lives in Havana, Florida with her big sweet dog, but will relocate to Italy in the spring where she will teach at the Florida State University International Programs campus in Florence.